Nercon, stainless steel frame 72" wide x 120" long belt accumulation table. Equipped with a 72" wide x 120" long accumulation section and 12" wide x 120" long (1) belt return section. Adjustable guide rails and an in feed /discharge range of 40" – 48". Conveyors powered by (2) ½ hp drives. Nercon, Pressureless Combiner / Inliner, stainless steel conveyor. Equipped with (1) 12" wide x 60" long infeed conveyor, (2) 4½" wide x 125" long lining conveyors and (1) 4½" wide x 170" long discharge conveyor. Each lane running faster than the previous one to move product inline. Nercon, stainless steel, bi-directional table top belt accumulation conveyor. Equipped with 4½" wide x 112" long delrin plastic product feed conveyor and (2) 18" wide x 48" long bi-directional accumulating belts which feed into the product conveyor. Mounted on a stainless steel base frame with height adjustable legs and an infeed / discharge range of 36" to 42". Automatic, stainless steel, high speed, down swing, inverted, bottle gripper rinser capable of up to 1,000 bottles per minute (2" diameter). Bottles: up to 7 3/4" diameter x up to 12"H. Has 3 3/8"H side belt neoprene grippers, hand crank adjustments for different bottle diameters, 48" infeed / discharge, E-stop, and barrier guarding with electrical interlock. Mounted on stainless steel frame with height adjustable feet. Nercon, Down Swing, gripper rinser, stainless steel, bottle cleaner rated up to 1,000 bottles per minute – depending on materials and application. Size range: 6 oz to 1 Gallon, 2-1/2" – 9" diameter, max height 12". Equipped with a 55" intake/discharge height, 282" length from center hub to center hub, manual hand crank size adjustment, drip pan, D-style bulb grippers, gripper chain, electrical panel, rinse bar, and two SEW Eurodrive 2hp motors. Mounted on a stainless steel frame with height adjustable legs. 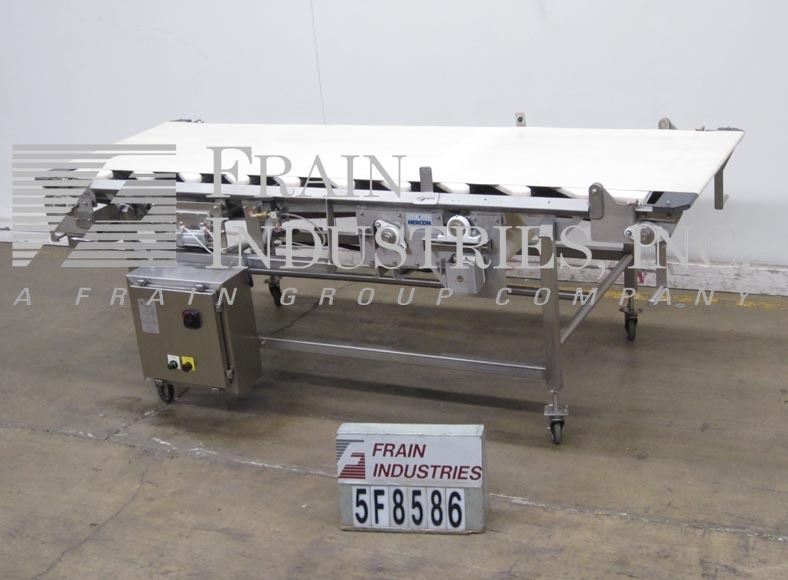 Nercon, stainless steel frame 42" wide x 108" long belt accumulation table. Equipped with a 42" wide x 108" long Intralox accumulation belt, adjustable guide rails and an in feed /discharge range of 35" – 40". Conveyor powered by 1 hp drive. Nercon, Model 3:1 combiner, collating conveyor. Equipped with a 22" wide x 80" long slip torque infeed conveyor with (3) lane pneumatic gate collating device and top hold. Collated product dicharges onto 24" wide x 48" long Intralox belt with pneumatic diverter arms. Nercon, stainless steel, bi-directional table top belt accumulation conveyor. Equipped with 4½" wide x 100" long delrin plastic product feed conveyor and (2) 24" wide x 83" long bi-directional accumulating belts which feed into the product conveyor. Mounted on a stainless steel base frame with height adjustable legs and a pneumatic height adjustable cover with a clearance range of 3" to 6" and (4) lift up access doors. Nercon, 36"W x 120"L x 35"H, Neoprene belt conveyor. Equipped with a 1/2 HP motor, Allen Bradley variable speed drive, and start/stop control. Pneumatic belt tracking system. Mounted on stainless steel frame with with casters.